Mega Sale! Free Shipping Included! Save 25% on the Delta DAS5316-SN Bathroom Shower Safety Grab Bar with 16'' x 1 1/4'' Angled Decorative, Satin Nickel by Delta at Defy Now. MPN: DAS5316-SN. Hurry! Limited time offer. Offer valid only while supplies last. The DELTA branded line of concealed screw grab bars provide the leverage and stability you need, while adding a decorative touch to your bathroom. The DELTA branded line of concealed screw grab bars provide the leverage and stability you need, while adding a decorative touch to your bathroom. Our grab bars are designed with a five-screw flange to give you installation flexibility and provide a secure mount, at any angle, with only 2-3 screws. The decorative flange cover fits securely over the grab bar flange, concealing the screws. The DELTA Angled concealed screw grab bar supports up to 500 pounds, meeting Americans with disabilities act (ADA) standards. 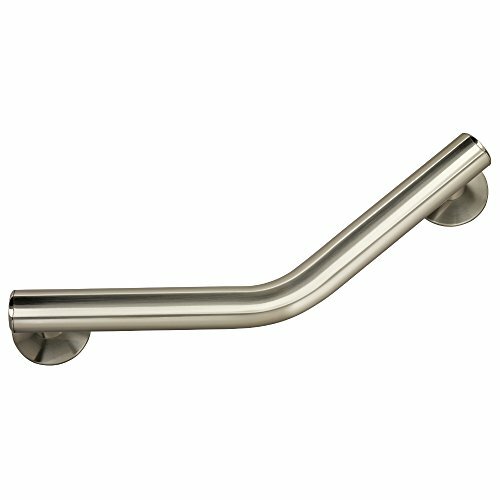 The DELTA Angled concealed screw grab bar in brushed nickel is corrosion resistant with a stainless steel bar for added strength and durability. 16" x 1 1/2".